Analysis on the life and death of Janis Joplin, the undisputed queen of rock and roll. This series unlocks the hidden secrets and events that result in the tragic deaths of famed notorious and the iconic. Every episode maps out the final 24 hours of a different famous person's life. 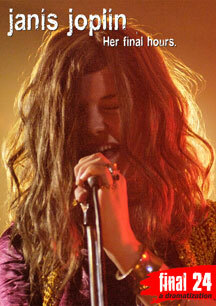 This episode focuses on the life and death of Janis Joplin, the undisputed queen of rock and roll. It explores how her drug addiction and a cut of nearly pure heroin took her from the throne to grave.